We left the expensive houses and their walled gardens behind as we left Angmering-on-Sea and entered Rustington. Rustington is noted for its two air speed records. On 7 September 1946 Group Captain E M Donaldson flew a Gloucester Meteor F4, reaching a speed of just over 616 miles per hour. On the very same day in 1953, Squadron Leader Neville Duke flew a Hawker Hunter Mk3, obtaining a speed of 727.63 miles per hour. 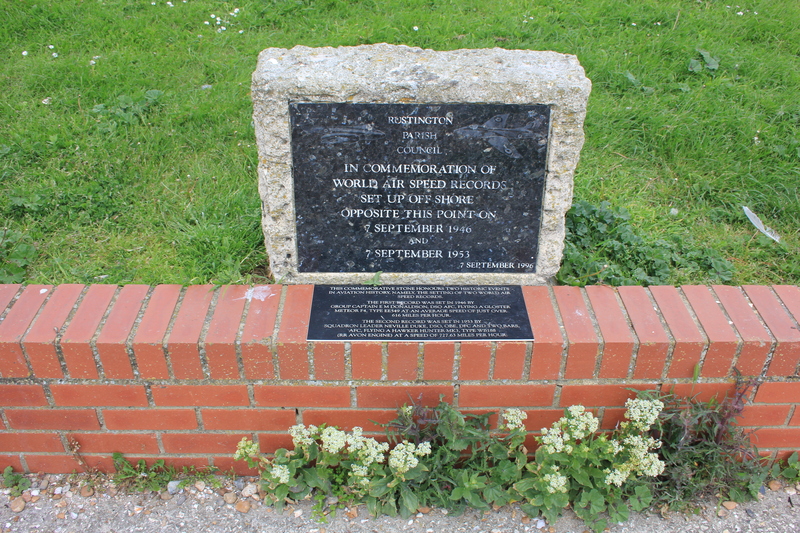 There is a small commemorative plaque by the sea front. By now we were feeling rather hungry. We strode on, reaching Littlehampton, where we came across the East Beach Cafe. Wow! What a strange looking building! You can’t help but enter a building looking like that! We were pleased we did, for we were served the best fish and chips we have ever had. Ever. The fish was fresh; the batter a crisp and dark golden brown. The chips were presented in a small metal receptacle lined with grease-proof paper. They were stood on end, poking their heads out at us. The grease-proof paper, I decided, was there to show off; to prove that there was not a drop of grease on these chips. After I finished the meal the paper was as dry as if it had been freshly placed. I could have written a note to the chef on it telling him how much I enjoyed the meal! Accompanying all of this was a small ramekin dish of mushy peas. These were the freshet, sweetest peas I have ever tasted. If you ever visit Littlehampton, go to the East Beach Cafe and have some fish and chips. You won’t regret it! We left the cafe and continued on our way, walking across the exposed beach towards Littlehampton harbour. 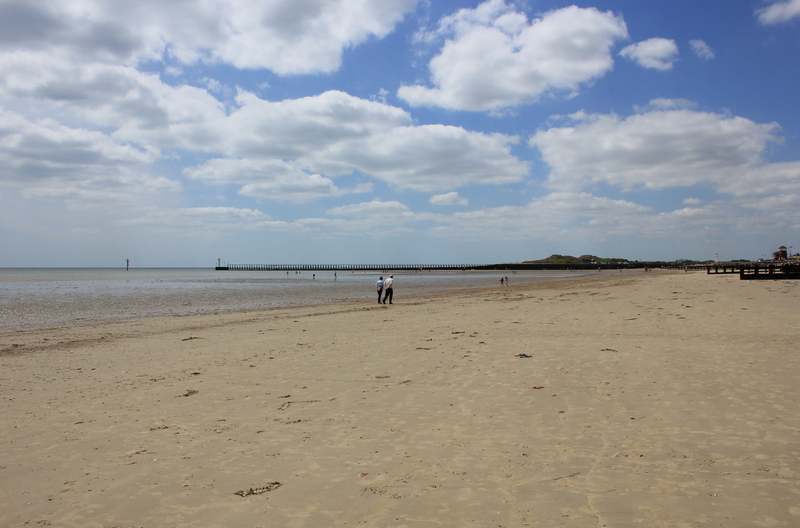 This entry was posted in West Sussex and tagged coast, fish and chips, littlehampton, record, rustington, travel, walking. Bookmark the permalink. 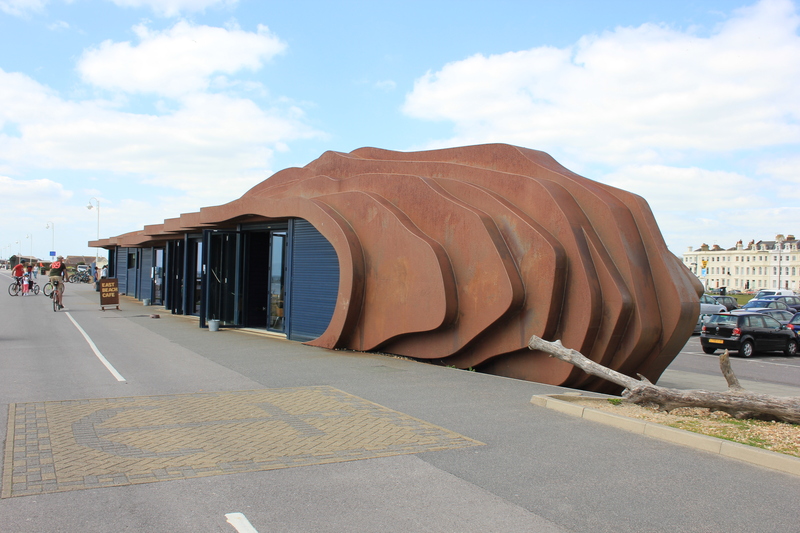 The East Beach Café was designed by Thomas Heatherwick of Olympic Cauldron and London’s Garden Bridge fame, or possibly notoriety in the case of the latter. I found your blog several months ago but as you can see I am still 4 years behind you.